Bring your ideas to life with the Lenovo Active Pen. 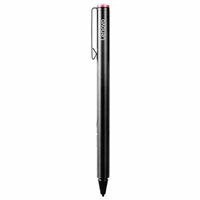 This pen boasts pin-point accuracy, palm rejection technology and 2,048* levels of pressure sensitivity to provide a natural pen and paper experience when you sketch and jot down notes. Powered by a single AAAA battery, the Lenovo Active Pen also features two built-in side buttons for ease-of-access, a USB pen holder for storage and three replacement pen tips for longer use.